XBLA is here to help you out with your overabundance of funds by slashing prices on Limbo, Shadow Complex, and three other pretty awesome games. For those of us who enjoy getting our gaming fix cheap (and really, who amongst us doesn't), the good people who run the Xbox Live Arcade have cut the prices in half for a couple of pretty awesome games. For today only, you can pick up Limbo, Shadow Complex, TRIALS, Monday Night Combat, and Castle Crashers for 600 MS Points (that's $7.50 for those of us who think in terms of actual money) each, half the usual price. Considering that these are top-tier titles and not obscure, crummy games nobody would otherwise buy, that's a damn fine deal. I can't personally attest to the excellence of all of these games, but I can in the cases of Limbo and Castle Crashers. 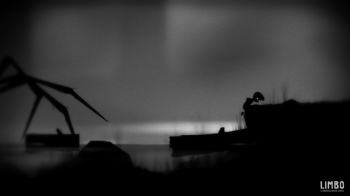 Limbo, which won numerous awards and was the third best selling XBLA game of 2010, is an atmospheric game that puts you in the shoes of a little boy attempting to navigate a creepy, monochromatic world, solving puzzles and dying repeatedly in the process. It's one of my favorite arcade titles, and I highly advise you pick it up. Unless you are afraid of spiders, in which case I advise you to never, ever play this game. Castle Crashers is not atmospheric or dark. It's also not entirely sane. What it is is a throwback to old-school arcade beat'em ups, with some of the best four player co-op I have ever had the pleasure to partake in. It was the best-selling arcade game of 2008, and for good reason. As for the others, the reviews and awards speak rather well of them. Shadow Complex is one of the best-selling XBLA titles ever and has a stack of "Best Downloadable Game" awards and "5 out of 5" reviews a mile high. TRIALS was voted the best XBLA game of 2009. Monday Night Combat was given great reviews almost unanimously. So there you have it. Five great games, all on sale. If you've got some spare cash burning a hole in your pocket, there are worse ways to spend it. Like on drugs.